A gang of villains wearing an odd black armored costume has been looting Gotham City and even Batman is having problems with them. But it’s actually only one person, Inque, forcing others to act for her. As her mutation gets worse and she begins breaking down she’s found a way to take over someone’s body and move it like a puppet. She’s stealing the funds to pay off one of the doctors who created the chemicals that originally mutated her so he can find an antidote. It appears to work but a fight with Batman leads to her falling and seriously injured just as her body resumes her Inque form, now back to what passes for normal now. What they got right: When Terry is sorry that Inque died (or so he thinks) Bruce is happy to hear that it bothers him. “The day someone’s death doesn’t bother you is the day that I start to worry.” is Bruce’s response and I like that. The idea that Inque can wrap around and manipulate someone’s body or just assume a clothing-like shape and force someone to do what she wants is a neat idea that we’ll never see again. Body-riding villains are a rarity but this was a nice version of it. What they got wrong: The idea of Inque having been “Inque” for so long that she might not handle being human” is something I would have to have seen explored longer than it was. 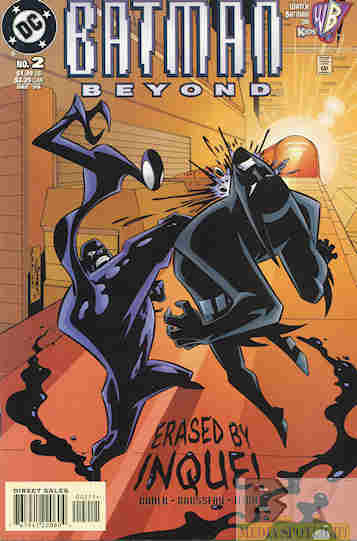 Recommendation: This was a really good DCAU Batman Beyond story. Worth checking out. Posted by ShadowWing Tronix on October 6, 2018 in Animation Spotlight, DC Spotlight, Television Spotlight, Yesterday's Comics and tagged Batman, DC animated universe, DC Comics, DCAU, Inque, Terry McGinnis.